1 of 4 Cook bacon in a medium saucepan over medium-high heat until crisp, about 4 minutes. Remove to a plate with a slotted spoon. Add olive oil to drippings in saucepan. Season scallops with 1 tsp of the Old Bay and add to saucepan. Sauté 2 minutes per side. Remove to a plate. Halve scallops, if desired. 2 of 4 Add onion and garlic; cook for 5 minutes, stirring frequently. Add broth, 1 1/2 cups water, remaining 1 tsp Old Bay, half the corn, the thyme, pepper and salt. Simmer for 3 minutes. 3 of 4 Puree remaining corn and 1/4 cup water in a blender and add to saucepan. 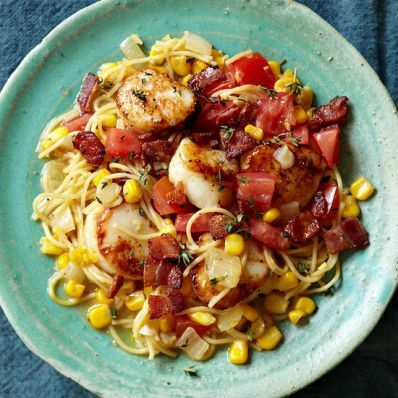 Stir in scallops, angel hair and tomatoes. Simmer for 2 minutes or until pasta is tender (it will continue to absorb broth as it sits). 4 of 4 Before serving, garnish each portion with some of the cooked bacon.